Poll Results: How much money do you save? In the last poll I asked you much money you save, and I am actually quite surprised with the results. A large majority of you save more than 20% of your salary, which is actually pretty good. First Gen American noted that the result for this poll is probably going to be skewed because it is posted on a personal finance blog, and it’s only natural that people reading such blogs are relatively smarter about their money, when compared with the rest of the population. That’s obviously true, and the only thing that makes it a little more representative of the general internet population is that a lot of search engine visitors also take the poll, and they are not necessarily subscribers. But in all honesty – yes – the results are a little skewed because someone reading a blog about money, and investments is obviously a lot more concerned about their finances than other folks. Anyway – if you’re saving less than 15% of your annual salary then know that a lot of people are doing a lot better than you in this department, and if you’ve never thought about your spending habits, then this is a good time to sit back, and take stock of how you can save, invest and build wealth. A penny saved is a penny earned after all. Let’s look at the results in a little more detail now. About 11% of the respondents said that they don’t save anything, and the only silver lining there is that this percentage is small, and I guess the only reasonable thing for them would be to start saving, however little possible, and develop the habit. When I think of this section, my thoughts invariably go to a few of my younger cousins, who have just started earning, and saving money or investing is the last thing on their mind. It’s probably good for them to have fun for a year or two, but eventually they will have to face the realities of life, and start taking more responsibility for their money. I hope they think about it sooner rather than later. If you are reading – Just get started! Next, let’s take a look at some of the themes that emerged out of the comments section. Hema said that she observed that a lot of other people think about their savings and investments in a very structured manner, and they have started to do that as well. And yes, a lot of people do give a lot of thought to how much they save, what their investments should be like, and I see this almost everyday in the kind of emails I get. People are concerned about the mutual funds they buy, about the ETFs they hold, and insurance they would like to buy. I’ve quite honestly not seen anyone think about money in a very structured manner in my close family, so for a large part of my life I felt that the whole world was like that, but thankfully I was exposed to people who thought about money a little more seriously, and that has been a really good experience for me. Structure and thought in savings is essential to get you started, and then to help you make better decisions, so the sooner you take a more holistic approach to your money, the better it is. Before I get to this excellent point that Indian Thoughts brought up, let me tell you that I’ve been following her blog for about a year now, and if you want to see structure you can see it there. She has these goals that she has set at the beginning of the year, and at the end of every month she does a post describing how well she did on the goals. You can check out the post for November 2010 to see for yourself what I mean. I have her on my reader just for the inspiration that I get from her discipline, and I really admire her for that. To her point – I feel that personally I’ve spent money many times just to kill time or overcome boredom, and that’s the worst way to use your money. For her, it has been enjoying what she already owns, and I’m trying to build this solar cell charger that keeps me occupied in my free time. I have made very little progress in developing it, but the point is that it keeps my mind from wandering to other wasteful activities, and even if I ultimately fail at building this solar cell phone charger I would have learned a few things I didn’t know before, and hopefully not wasted time on buying junk to keep myself occupied. If you’re the kind of person who sometimes shops just to kill time, then you might want to think about this point a little more. 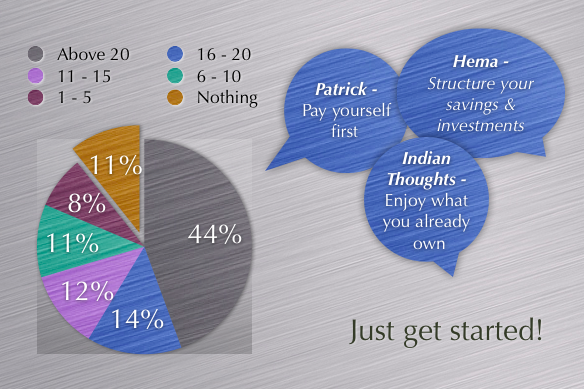 Patrick spoke about paying yourself first, and this is a common theme that you come across many personal finance blogs. The idea is that you set up your bank account in such a way that it automatically transfers a certain sum every month from one account to another, and forces you to save. If you’ve tried to save, but not found much luck with it then you can try this automatic way and see if it works for you. I have neither positive nor negative feelings about this, but I know that it surely works for some people, so you should definitely try it out if you’re having trouble getting into the saving habit. I don’t write about the thrift or the savings aspect of personal finance as much as some other bloggers do mainly because it is somewhat boring when compared to looking at yields, or discussing IPOs and ETFs etc. but I do realize that being thrifty, and having a good control on your spending is really important too, so for suggesting this topic and bringing my attention back to it – a big thank you to Raja, and of course a big thanks to all of our commenters for their thoughts too! Author ManshuPosted on December 7, 2010 Categories Thrift2 Comments on Poll Results: How much money do you save?